Seattle has imposed a $15/hour minimum wage. Of course, this will kill jobs. It is basic economics: you cannot pay someone $15 to produce $10 worth of value. However, this essay is not about that. Nor is it about the impact on prices. This essay is about the impact on goodwill. I am developing a series about the concept of goodwill. America once had lots of it. It is now being dribbled down the drain, dripping away, one drop at a time. This new minimum wage hike helps. This picture of a card helps explain. This may be just one angry dude, or it could be a big movement. I see it as another notch taken out of goodwill. As with the cops and perps I wrote about previously, both sides have a legitimate gripe. Emotions are running high. And no one sees the merit in the other side, only in their own. It’s the perfect toxic cocktail for killing goodwill all around. Think on it for a moment. What cultural backdrop is necessary for a whole industry to pay near zero in wages, and workers earn the majority of their compensation from tips given voluntarily by total strangers? It is remarkable how much trust and goodwill must be there. This is not typical in the third world, and it was not typical through most of history. Will people continue to tip, and tip generously, if they feel workers are overpaid? What if they feel that these workers lobbied the government to mandate their overly rich compensation? And suppose the patron resents that his favorite restaurants have closed, and now in any survivors, he pays a lot more than he used to. Of course, the workers feel that they are falling farther behind, as real wages are lagging everything else in the economy. They resent their bosses for being too greedy, and they resent politicians for not setting the wage high enough. They are angry and resentful at lots of things, except the root cause: the failing dollar. What do you get when you cross worker resentment with restaurant patron resentment? 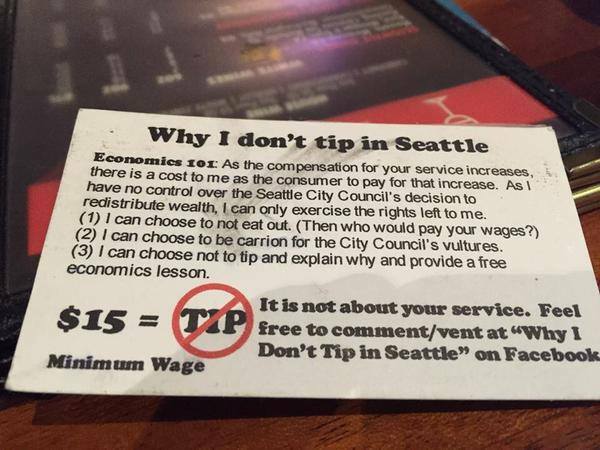 We could be one coercive wage hike away from killing tipping in America. This entry was posted in Uncategorized on July 20, 2015 by Keith Weiner. Regarding your comment, “workers lobbied the government to mandate their overly rich compensation” ..
without going into a rant .. do you have no problem with millions and hundreds of millions being LOBBIED by the 1%? or you do? Me thinks NOT. See the 1% are not yet overly rich … they want it all. As a matter of fact, yes, I do have a problem with cronies lobbying for loot. I write about this problem almost every week. In a way, your comment strikes me as a symptom of the very decline in goodwill that I intend to chronicle. I discussed minimum wage law, and you accuse me of supporting crony rent-seekers. It’s not either-or. One can be against both. I am. As to my emails, I don’t send any emails. You signed up on WordPress to subscribe to my blog, and you can unsubscribe. I don’t think I can unsubscribe you. Sir, it seems that instead of asking to be removed from Dr. Keith Weiner’s, PhD, mailing list, perhaps you should start trying to learn a little about economics. Seattle is the petrie dish that can help teach economics to Seattle’s inhabitants. Work has value and that value determines a true wage for that work. When politicians create artificial minimum wage scales the deny that basic economic principle e.g. value created by worker must wxceed payment to that worker in order to function. Seattle is having a closure rate of restaurants exceeding the norm in other cities because of this mandated minimum wage. The net result is that some workers have increased their income artificially and some workers have lost their jobs. furthermore, Seattle is no longer a viable city for entrepreneurs to invest their capital in creating new businesses. This therefore creates a net loss for the labor force and the cities base tax structure. Everyone is forced to pay a higher rate for everything and will eventually create another Detroit. The only saving factor at this point is that there are a high percentage of technology businesses in the city that help absorb some of these detrmental effects. i doubt that you will ever understand that the so called “1%” are the driving force to cretate jobs. a poor man is seldom the man that hires people to work for them. His viewing of your site will not be missed, Keith. Clearly, punctuation is a problem for that individual since you posed that as a question, not as a statement. This “?” is different than “.” or “!” this, Jim. Posing a question was not to be assumed as support for said statement. I think that your argument about goodwill is interesting, but I also think that all parties would be better off if restaurants paid servers for their labor and charged diners the actual price of the meal. The tipping system as practiced in the U.S. works really badly, mostly for hard-to-fix behavioral economics reasons. “The tipping system as practiced in the U.S. …” is a function of the Fair Labor Standards Act (1938) which mandates those minimum wage rules. Why is there a Law in the first place? Of course, no worker is paid more than s/he produces of value. Employers are not stupid, except when compelled by policemen. It is “fitting and proper” that Seattle should move in the direction of “old Detroit,” but don’t wait for the data. Any increase in demand might swamp the substitution effect of the forced labor-cost hike. The REAL ISSUE is the government coercion involved, mandating employers only hire workers who pass the “productivity” test, which most Minority youth do not.